Facebook at Work is the professional version of the public network used by 1.65 billion active users. Just like the public version, users have a profile page featuring a photo, description, projects and skills, which are entirely customizable. Communication amongst colleagues does not differ in any way from the classic version: members can use the conversation wall, Messenger chat, offline messages, comments, likes, etc. The isofunctional environment between the premium version and the free version is what makes Facebook stand out in the highly competitive ESN market. Because Facebook is already used by most employees in their personal life, no training is necessary before they can use the software in the workplace. Adoption rates for this solution are therefore exceptionally high, averaging about 90%. 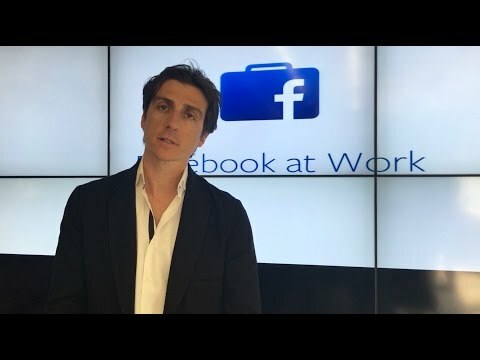 In terms of collaboration, Facebook at Work allows you to create work or project groups. All of the standard administrative functions are included. Colleagues can also create RSS information feeds in order to be notified of all relevant information. Finally, Facebook allows you to create events for all colleagues or private events. Le prix de Facebook at Work n'est pas encore connu. What steps can you take make to adopt a better connected, more efficient approach to running a business? Using software for instant file-sharing, immediate communication with colleagues and overall more productive business operations is a very good place to start. If you are interested in optimizing the management and organization of your company, continue reading to see what we have to say about Enterprise Social Software.